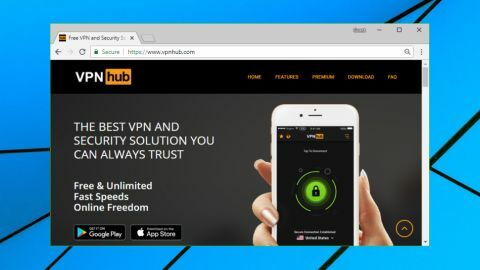 VPNhub's free plan sounds like it should appeal to just about anyone, with the website claiming it offers 'unlimited bandwidth on your device of choice.' What it doesn't highlight is that this gets you access to a single location only, apparently in your nearest country, and the free plan is only available on iOS and Android. Still, a free VPN with unlimited bandwidth is always going to be useful. Signing up for the Premium plan gives you access to 75 locations across 50 countries, as well as faster speeds, and allows you to use the service on Windows and Mac. We're normally cautious of new VPNs offering lots of locations, as it's not always clear who is behind their network. VPNhub appears to use servers owned by StackPath, though, the cloud giant behind IPVanish, which gives some reassurance about likely service reliability. Pricing looks high, at $13.99 billed monthly, dropping to $6.99 if you pay for a year upfront. If you like the IPVanish network, you could sign up with them directly for a little less, at $6.49 per month on the annual plan. If you're willing to subscribe for two or three years, you can pay under $3 a month with providers such as CyberGhost, KeepSolid VPN Unlimited and NordVPN. Still, if you'd like to try VPNhub Premium, sign up at your app store of choice and you'll get a week of testing time before you're charged. But that's not the whole story. The policy also includes this key section. When VPNhub app is launched, but before you connect to the VPN, we and our third party service providers collect device-specific information such as unique mobile ID, operating system and platform, browser type and version, network information and other technology on the devices you use to access the Website or the Services." VPNhub may not log what you're doing online, but it can fingerprint your device and grab plenty of information about it, and that data may be accessible to others. Put this all together and VPNhub clearly has a few privacy issues. That may not matter if you just want a simple VPN to encrypt regular internet traffic on public Wi-Fi, but we would think carefully before you use the service for anything important. VPNhub free build is only available on mobile devices, so we began by grabbing a copy of the Android version. Installation was hassle-free, and we were launching the app within a few seconds. After some initial upselling where the app prompted us to try the Premium version, we were able to get started. A simple interface keeps everything very straightforward: tap an unlocked padlock to connect, tap it again to disconnect, and that's about it. There's a separate list of servers, but as the free version only allowed us access to the UK, that didn't matter very much. The Settings dialog has gained a couple of useful features since our last review. New support for split tunneling enables both free and Premium users to define apps which won't send their traffic via the VPN. An Auto Reconnect setting will automatically reconnect if the VPN connection drops, although this is only available to Premium users. These options are welcome, but most apps deliver much more: autostart options, automatic connection when you access untrusted networks, choice of protocols, an integrated kill switch, and more. VPNhub looks very basic by comparison. Performance was reasonable for a free service. Our test Android device averaged download speeds of around 70Mbps on Speedtest.net, and this fell to around 20-25Mbps after connecting to VPNhub. That's a significant drop, but we've seen commercial services that are slower, and it's fast enough for most purposes. Tapping the 'Start Your Free Week' gives you speedy access to VPNhub's Premium service. Be sure to read the screen carefully, though – by default you're signing up for a monthly subscription which automatically renews at a very expensive $13.99. We installed and launched a copy of the Windows client. This opens with the simplest of interfaces, just the name of the currently selected country, and a Connect button. Clicking the country name displays a list of your other location choices, sortable by country, city or server load, and with a search box to filter the list by keyword. That's good, but we would have preferred a Favorites system, or even a Recent Servers list, to help speed up reconnecting to commonly-accessed locations. The Settings box is more capable, with options to choose your protocol (IKEv2 or OpenVPN), scramble OpenVPN traffic to help bypass VPN blocking, enable or disable a kill switch, or have the app automatically reconnect if the VPN connection unexpectedly drops. We tested VPNhub's kill switch, with mixed results. When we forcibly closed the VPN connection, the client immediately blocked our internet access, preventing any data escaping the tunnel. But sometimes it would then refuse to connect, before repeatedly warning us that 'exception of type DotRas.RasException was thrown.' We had to close and restart the client before it would work again. As we tried the clients, we noticed a few other small issues. The location list was sorted alphabetically by default, for instance, but sometimes we'd find the client had rearranged the servers for no apparent reason (we're talking sequences like Serbia, Australia, United Kingdom, Denmark, Canada, Singapore...) You can fix this quickly by clicking the Country column header to reset the sort order, but it really shouldn't be necessary. VPNhub's site unblocking performance was what what we expected: basics only. It got us in to US YouTube, Comedy Central and the relatively easy sites, but we had no luck with US Netflix, BBC iPlayer or any of the better defended platforms. VPNhub did well in our performance tests, at least initially (no surprise, if it really is using the IPVanish network). Our test system managed an excellent 65-68Mbps when connected to our nearest UK servers, near European connections were almost identical, US speeds varied hugely but were always usable at 20-60Mbps. Going long-distance revealed some weak spots - 1-2Mbps for Malaysia, really? - but they were outweighed by better performers, like Australia's average 30Mbps, and for the most part, VPNhub Premium gave us reasonable speeds.